Bill Gates once stated that, “People often overestimate what will happen in the next two years and underestimate what will happen in ten.” He’s more right than most people can believe. The impact of mobile technology is easy to underestimate. We take it for granted. We shouldn’t though. Internet usage via mobile phones is expected to overtake desktop usage this year. 70% of mobile searches lead to online action within an hour. The global mobile market will grow from $3.4 billion in 2010 to $22 billion by 2016 – an increase of over 500%! 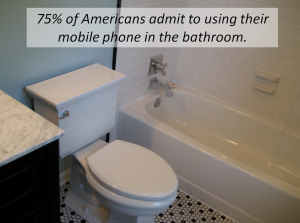 75% of Americans admit to using their mobile phone in the bathroom. And it’s not just businesses looking to make an immediate transaction (sale) where mobile is making an impact. Last year, the Associated Press reported that Nielsen will start counting viewership of television shows on mobile phones and tablets in addition to standard television sets. Considering that so far, Neilson has relied on homes being equipped with monitoring equipment to count viewership, this sounds like a daunting task. They will make it possible by using embedded codes within the programs themselves that can be traced back to mobile devices. As expected, some critics are already saying that it’s too Orwellian, but I don’t see that their concerns will stop it from happening. This will begin with the Fall 2014 season, which is just about to start, if it hasn’t already in the case of some shows. I know that in my own home, I often watch Netflix on a mobile device, especially when I just want to find a quiet place to relax and catch up on House of Cards. I still remember an article that I read in the Harvard Business Review (HBR) a few years ago showing how they expected mobile devices to impact brick and mortar shopping. In the article, customers that had signed up for a store’s loyalty program allowed the store to track their location through their mobile device. When a customer gets close to the store, such as getting into the parking lot of the shopping mall, the store would automatically send the person updates on new products, sales and more. Some may also consider that to be a bit too Orwellian, but remember that it would be voluntary, the customer has to agree to accept their incoming content. At my own company, one of the earliest mobile apps that we made available for our own reps and our B2B partners was a cross-reference list to help convert dental offices from a leading competitor to our brand. I originally created the tool using Microsoft Excel, which was fine for our customer service department, but wasn’t as helpful to reps in the field who didn’t have time to break out their laptop in a busy dental office. By going mobile, we made the tool far more user friendly and were able to quickly cross reference the other brand to our own. My two personal favorite uses of mobile’s impact on marketing are the apps: Key Ring and Bar Code Scanner. With Key Ring, I can eliminate carrying the plastic cards and key ring tags and place my identifying information onto my cell phone. This has made both my wallet and my key chain much lighter and I can get special offers right through my phone, almost like I mentioned from the HBR article. As for Bar Code Scanner, I can quickly and easily see who has the best price on items before purchasing them. When shopping for a laptop a few years ago, I was fully prepared to buy it at the store my wife and I were in, but they were sold out of them. By scanning the product’s bar code from an empty (demo) box, we could see who else was selling it and at what price. We called over to make sure that the other store had one in stock and drove over to make the purchase. That saved us a lot of time and aggravation! Now, ask yourself: Is your company prepared to meet the demands of the future by taking advantage of what mobile has to offer or will your competition beat you to it? ← How Many Slacktivists Does It Take To Raise $14 Million?